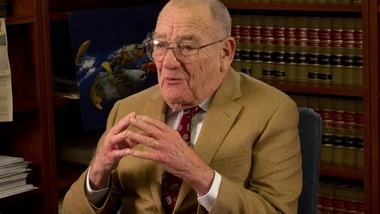 In his first interview since stepping down from the Northwest's landmark legal case involving salmon and hydropower, U.S. District Judge James Redden says the four dams on the Lower Snake River should come down. And he makes clear his support for spilling more water to help juvenile fish. "I think we need to take those dams down . . . And I've never ordered them you know - or tried to order them that you've gotta take those dams down. But I have urged them to do some work on those dams. . .and they have." The four dams on the Lower Snake that Redden refers to are the Ice Harbor, Lower Monumental, Little Goose and Lower Granite dams. Redden is no longer in a position to exercise legal authority over how federal agencies operate the Columbia-Snake system's hydroelectric dams and enforce environmental policy to ensure the survival of the steelhead and salmon. But the judge, whose courtroom is in Portland, still speaks with a uniquely powerful voice on the issue; Redden is the one person charged with listening to hundreds of hours of testimony, poring over thousands of pages of legal briefs and scientific research, and then rendering his independent judgment on how to make sure the mandates of the Endangered Species Act are upheld. That wasn't lost on Bill Sedivy, executive director of the conservation group, Idaho Rivers United. "By virtue of his position, Judge Redden has followed this issue and the science of this issue perhaps more closely than anyone in the Pacific Northwest," Sedivy said, reacting to Redden's comments. "So his position is an informed one, and we agree with him." In his interview Redden also defends his decision to order the Army Corps of Engineers to spill more water -- a policy meant to help more juvenile salmon survive their trip to the Pacific Ocean. The move has roiled opponents who want as much water as possible to flow through the dams' turbines to generate more hydroelectricity. Redden says he decided to order more water spilled over the Columbia and Snake dams based on the advice of scientists. And the results -- better survival rates for juvenile salmon (pdf) -- convinced him it was the correct decision. "I had some people call and say it just looked like a river. . . and they could see the fish. It was just dramatic, the results," he says. Redden's dam-removal advocacy is reigniting debate over one of the most controversial questions when it comes to saving salmon and steelhead. Many commerce groups oppose dam removal. Only Congress can authorize such action. His comments generated a swift response from Northwest RiverPartners, which represents port, shipping, and hydropower interests. Its executive director, Terry Flores, said she respectfully disagrees with Redden when it comes to taking down the Lower Snake River dams. "These four dams produce 1,100 megawatts of clean, renewable energy - enough to power the City of Seattle," she said. "And, the dams allow farmers to produce and ship food that feeds the Northwest and the world." Predators take advantage of the juvenile salmon's vulnerability as they emerge from fish passages at dams. The reservoirs force salmon to exert energy as they swim through slackwater, leaving some too exhausted to survive. The dams expose salmon to deadly turbine blades and unsafe plunges from above the dams where spillways allow them to continue around the barriers. Save Our Wild Salmon, a coalition that has long pushed for removal of the four Snake River Dams, hailed Redden's comments. "Removing the lower Snake dams is the measure most likely to restore wild Snake River salmon," said coalition member Doug DeHart, a former Oregon chief of fisheries. "The judge knows it, scientists and economists know it, conservationists know it. The only real question now is why don't the federal agencies know it?" In his interview, Redden discussed some of the things he's learned through his unique role in overseeing hydro and salmon policy in the Northwest. Redden says the collision of legal, political and scientific worlds hasn't just been a challenge for himself. "The politics of it makes it difficult for some of the scientists, I think," he says. "But because we have those scientists, we have made a lot of gains -- many gains -- in the last ten years." Redden's comments came from an interview last week with EarthFix journalist Aaron Kunz for a documentary he's preparing for Idaho Public Television, and Cassandra Profita, OPB's Ecotrope blogger. Idaho Public Television's documentary on salmon for Outdoor Idaho airs this July. Video Excerpts from upcoming Outdoor Idaho. Judge Redden on Saving Salmon: Tear Down Those Dams <-- Watch excerpted clips at original site.